Visit success.gtcc.edu to get started on YOUR path to success at GTCC. Guilford Technical Community College operates under the “open door” policy of the State Board of Community Colleges (North Carolina Administrative Code, Title 23, Section 2C.0301). Any individual 18 years old or older and able to profit from further formal education, or high school graduate under the age of 18, may be admitted to the college. 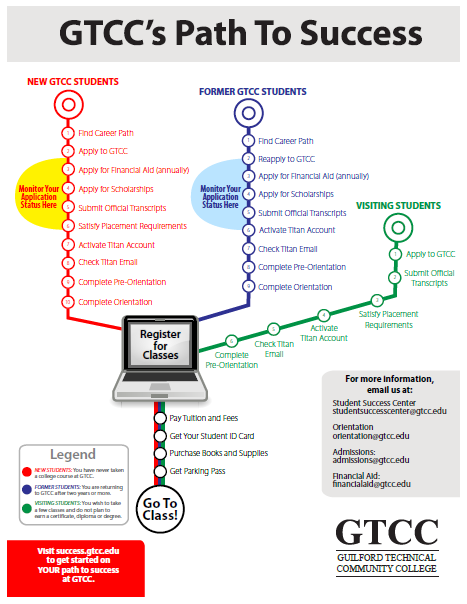 Individuals under 18 years of age who have not attained graduation from high school can attend GTCC as stipulated by the policies of the State Board of Community Colleges and the procedures specified by GTCC. Admission to the college, however, does not ensure admission to any individual program or course or continued enrollment in the college. Upon making application to the college, the individual may be tested and/or interviewed as required by certain programs or if deemed advisable by admissions personnel. An applicant is granted admission into a specific program when there are instructional spaces available and where the student has demonstrated the aptitude for that program as determined by personal interest, academic background, and/or test scores. If there is any indication of academic deficiency, the prospective student will be given an opportunity to remove the deficiency through preparatory alternatives. GTCC recognizes valid high schools registered with their state department of education. However, if GTCC has determined that a high school is not a valid diploma-granting institution, students will be ineligible for Federal and State financial aid. Students not completing such a program must complete the GED or attain an Adult High School diploma through a valid diploma-granting institution. Secondary institutions outside of North Carolina will be determined as valid based on the above information, given the institution’s state department of education.